Let us and your smartphone be your guide: explore the highlights of the sacred isle by following this well-designed route. 1. 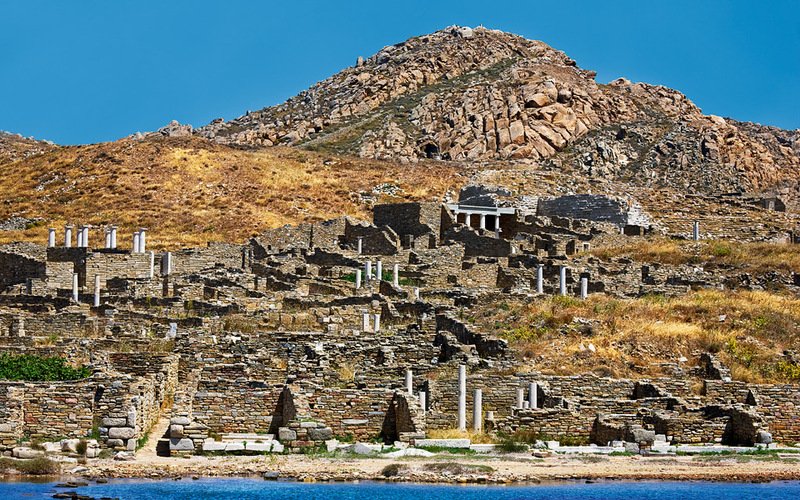 Over the centuries, the port of Delos was the landing point for pilgrims, traders and slaves. Today, it welcomes visitors to what is a stunning open-air museum on the site of one of the ancient world’s most sacred spots. 2. The French Archaeological School of Athens has been at work here since 1873 and maintains a small library for visiting antiquity scholars. 3. 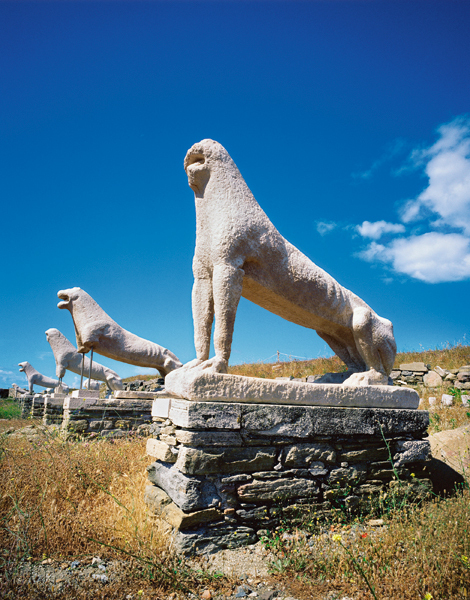 A number of the statuary lions of Delos, given to the island by the Naxians in the 7th c. BC, are missing, plundered over the years or otherwise lost. Those that remain, however, are perhaps the most recognizable sight on the island. Delos view of the area around Mount Kynthos. 4. The Sacred Lake is the legendary birthplace of Apollo and Artemis. Although it was drained in 1929 to prevent the spread of malaria, there is a circular wall that marks where it used to be. 5. The Agora of the Italians was one of the largest agoras on the island; in ancient times, it was surrounded by shops. 6. The Minoan Fountain, a freshwater well inside an impressive structure, was a public water source. The Archaeological Museum of Delos. The famous marble Naxian lions. 7. The Stoibadeion, a shrine dedicated to Dionysos, was at the center of many of the island’s theater festivals. 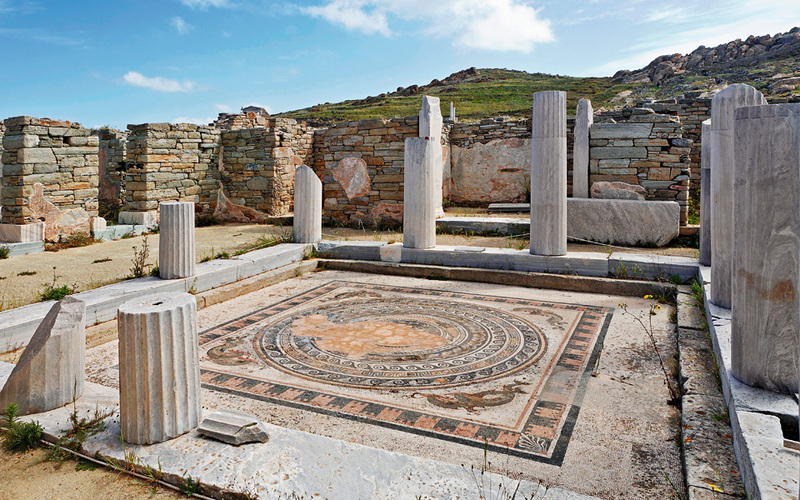 8.The Archaeological Museum of Delos was built in 1903, making it one of the oldest museums in the Cyclades. It holds many of the invaluable treasures discovered here. 9. The three main temples dedicated to Apollo, the remains of which stand at the center of his sanctuary, brought thousands of pilgrims to this spot. 10. The Temple of Artemis, dedicated to the twin sister of Apollo, was another important place of worship on Delos. 11. 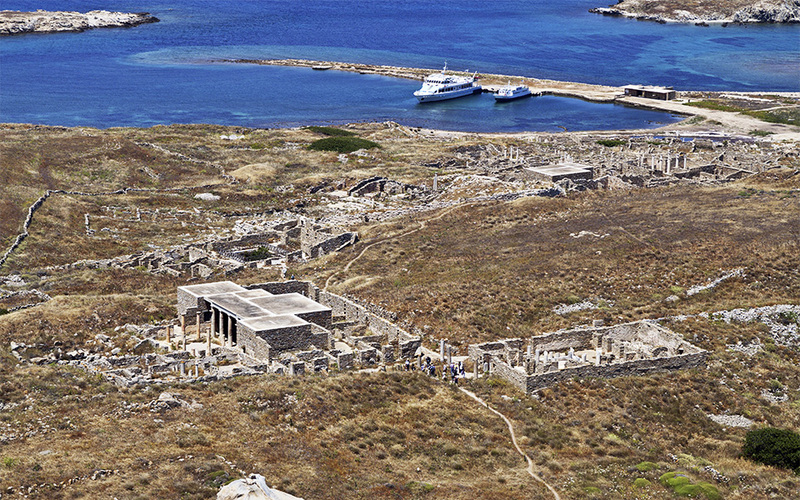 Many different regional powers erected structures on Delos in exhibitions of wealth and power. Near the Propylaea, built by the Athenians, visitors can also see the Portico of Philip V of Macedon and the Portico of Attalos I, King of Pergamon. 12. The Marketplace of the Competaliasts, a 1st c. BC square used by the island’s trade unions, is further evidence that society on Delos was made up of a number of merchant associations. 13. 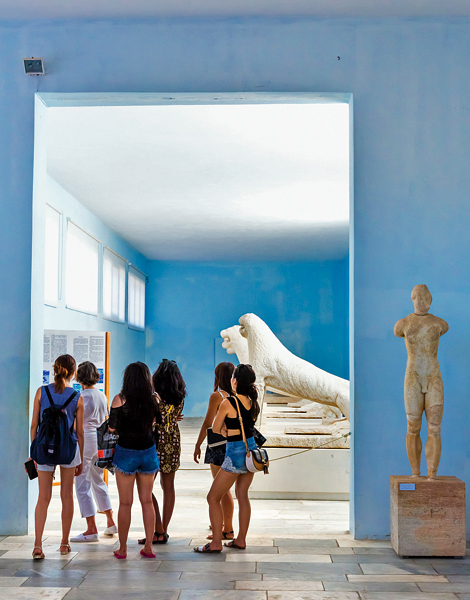 The House of Cleopatra, the wife of Dioskouridis, a man of high standing in Delos around 137 BC; statues of the two of them (replicas) stand at the building’s entrance, still welcoming modern-day visitors. The originals are to be seen in the Museum of Delos. 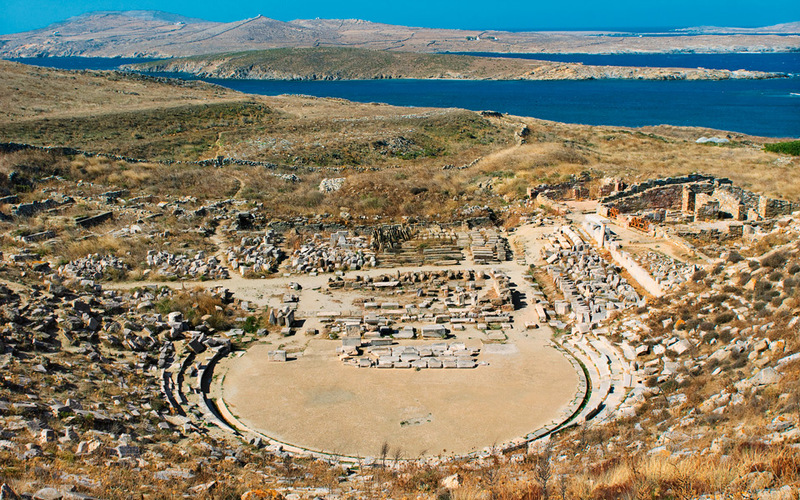 The view westward from the uppermost rows of the Hellenistic theater of Delos. 14. The House of Dionysos bears this name because of a stunning mosaic discovered here (there is a replica in place now, but the original is nearby in the museum) that depicts the god of wine and theater. 15. Theater was an important part of the cultural life of the island. The ancient theater could hold up to 5,000 people. 16. The House of the Masks has been partly restored and offers visitors a more complete look into what life here was like in the distant past. The House of the Dolphins at Delos. 17. In the House of the Dolphins, a mosaic depicting the Phoenician goddess Tanit indicates that Delos also functioned as a meeting-place of cultures and beliefs. 18. From the Sanctuary of the Egyptian and Syrian Gods, the view is magnificent, and impresses on the viewer the scale of the ancient settlement. 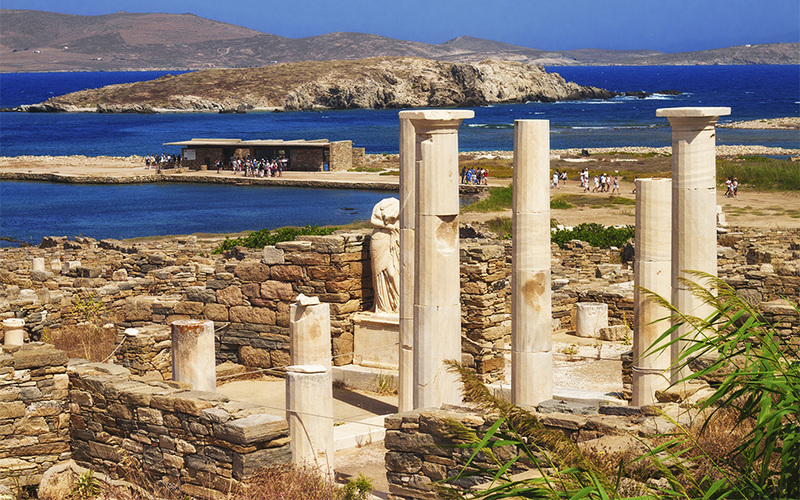 At its height, Delos’ permanent population was far greater than that of present-day Mykonos.